GEISSELE AR 308 HI-SPEED NATIONAL MATCH TRIGGER SET combines their exceptional match-grade trigger with their Service Rifle, Designated Marksman Rifle, and Match Rifle Spring sets. Geissele’s adjustable Hi-Speed National Match 308 AR Trigger is designed for competition, hunting, and tactical sniper use, where exact trigger pull weight is essential for success. With the Geissele Hi-Speed National Match Trigger in your AR 308, you can easily adjust the triggers first and second stage weight, as well as total pull weight and over-travel to your exact preference. 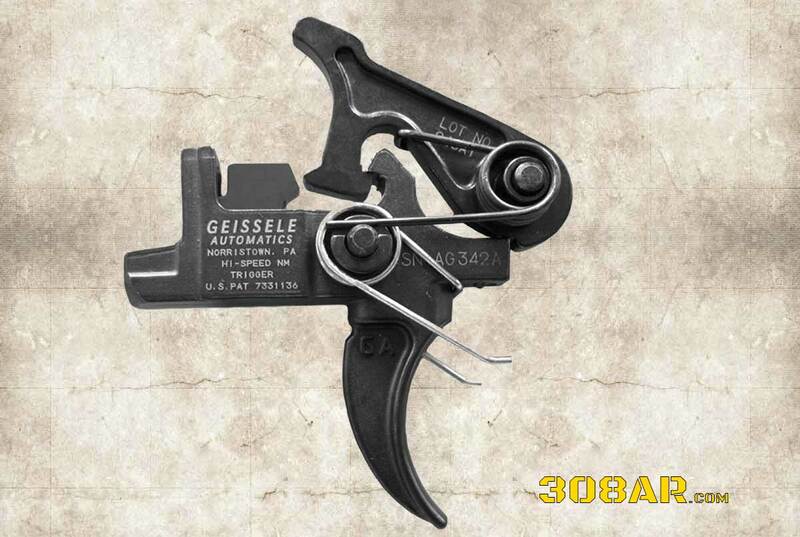 Geissele Automatics currently offers three large pin Hi-Speed trigger products. These adjustable triggers are specially designed for competition, hunting, tactical, and military use, where both accuracy and robustness are critical. As an adjustable trigger, the first and second stage weight distribution, as well as, total pull weight, over-travel, and sear engagement are all to be tuned to the shooters preference. The Geissele Hi-Speed Service is designed for NRA High Power Service Rifle competition. It is an approved trigger for use in CMP sanctioned competitions such as: National Trophy, NTIT and all Excellence In Competition matches. Service Rifle competitions require military-based weapons to meet certain criteria, one of which is a minimum trigger pull weight of 4.5 lbs. Our Service Rifle Trigger includes our exclusive 5-Coil trigger spring which will give a nominal 4 lbs. on first stage. The Service trigger pull weights are biased with most of the pull weight on the first stage. This will allow a light second stage with an icicle-sharp break, effectively giving your weapon a match-grade trigger let-off. The Geissele Hi-Speed Designated Marksman Rifle is designed for tactical and military shooting where trigger pull weight is not regulated. Perfect for all precision tactical shooting and squad Designated Marksmen, the higher second stage weight helps in high-stress shooting situations. The Geissele Hi-Speed Match is designed for NRA High Power Rifle competition with highly modified AR-15 Space guns. AR-15 Space guns are the Formula 1 weapons of High Power Rifle competition. With very few restrictions, these highly customized semi-automatic weapons are intended to produce extreme accuracy at long range. The Geissele Match Trigger is a perfect Space gun add-on as the pull weight can be adjusted to low levels that enhance trigger control. The fast lock time assists the shooter in getting every ounce of accuracy out of his weapon. The Hi-Speed hammer uses a full-power hammer spring which imparts more kinetic energy into the firing pin, producing much more consistent primer ignition – especially with experimental cartridges or AR 308, 308 AR and AR-10 based weapons.